Please email me if you are from the Bascom family. I have very little information on the Joseph D Bascom family, and would love to hear from you. I got an email from Genevieve Niessen in Nov 2011. She forwarded me the letter to the left, pdf attached. I have not yet made contact with any Bascoms directly related to Joseph D Bascom, and eagerly await any information you may have to share. It is my understanding that Ralf F Bascom (as mentioned in the letter) likely contacted Joseph D Bascom to see if they were related. Genieve is the Great Niece to Ruth Bascom noted in the letter. Genevieve's letter to me is below. Thought this might be of interest, particularly the 1920's letterhead... I looked briefly at your genealogical info on your and Brad's websites - I was amazed at the number of Bascoms who attend the reunions. Although I was unable to identify potential relations, I am impressed by your collection and am glad I found it! I am so thrilled to get your email. I am not familiar with the Bascom line. I did get pictures of their graves. I think I may have put those online. I don’t recall, but I did send them off to Brad. They were at Bellefontaine Cemetery in St Louis. I don’t think Brad specifically tied his family to Joseph D. Not quite sure. If he has the relation, I certainly would like to put that on my website. Brad was my inspiration for starting my journey, as his email prompted my interest in this entire website and 5+ years of discovery regarding the Broderick family and Broderick & Bascom Rope Company. I have connected with family I did not even know existed. I have visited Seattle and had wonderful fun finding the 100+ year old buildings, photographed by a famous photographer in 1908. Just so rewarding for me. Thank you Brad for your emails way back when. I love this letter. What a jewel. I have not yet seen this particular letterhead, and love all the awards along the left side. Can I have your permission to put your emailed information online (family names below)? I would not put your email on there, unless you prefer that. I personally would prefer it as other people do contact me who are related. This is very interesting material indeed. The Broderick & Bascom letterhead is always interesting, and of the variations I've seen, your letter is one of the most impressive. Thanks for sharing it. The Isaac R. Bascom referred to in your letter is the great-grandfather of Susie Szynalski, who I have copied on this email. Susie and I have researched Bascom genealogy together for a few years now. 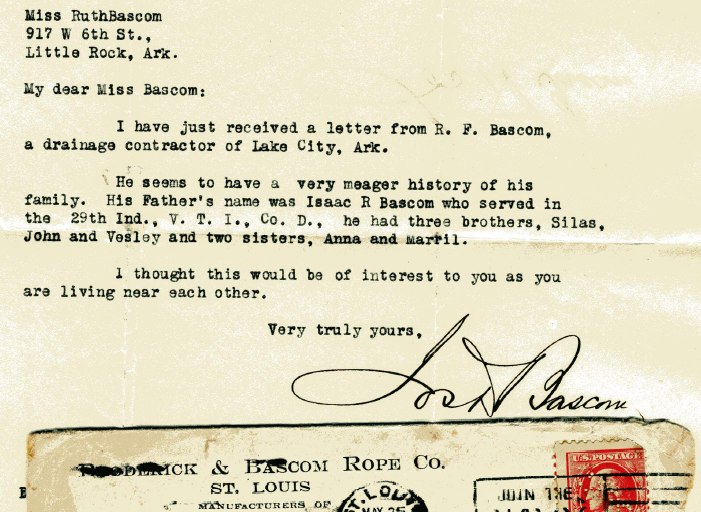 We can fill you in on the rest of Isaac's family, but more than that, we'd be interested to work with you to research your ancestor Thomas H. Bascom. While Susie is in Indiana, I am located in Groton, Massachusetts. And I lived for a while in Malden, so I'm familiar with your Medford area. Have you been to the Boston NEHGS library? I am a member, but don't find the time to go often. Susie and I are both members on Ancestry.com. Jeanne took wonderful photos at the cemetery in St.Louis, and I created several Find-A-Grave memorials for the Bascom family there. Here is a link to Joseph Dayton Bascom's page. My relationship to Joseph D. Bascom is remote. We are 4th cousins, 4 generations removed. Susie's connection is 3rd cousins 3 times removed in an entirely different line. So Isaac R. Bascom was 3rd cousins to Joseph Dayton Bascom and I'm pretty certain they did not know that themselves. I guess you've seen our web sites. There are lots of photos on our Bascom Reunion facebook page as well. Hi Brad, I used to live in Pepperell when I was little and had friends in Groton that I went to school with! And Susie, my brother & sister-in-law live in Indiana (Mitchell) - they and my husband attended Purdue. Small world. I am a member on Ancestry, but have not yet visited the NEHGS. I found Thomas H. and wife Alice in the 1880 Census, but by the 1900 Census Alice is a widow. I have a copy of their marriage application, but nothing else to speak of. No idea of his parent's names, but he stated in the Census that they are from Kentucky (father) and Pennsylvania (mother). I did a *brief* Ancestry search, but didn't come up with much. The letter mSusie mentioned was one written to Joseph by my great Uncle Richard asking about the family lineage. I wish I had the original, but my mother gave it to someone and I don't have it, It is basically a recopy of the Thomas Bascom 1871 book which is now on line. How times do change! I'll check my source for Joseph Bascom's home. It was quite an architectural gem in St Louis. I think there was even a picture of it in my source. I'll look for it and send it to you. It was quite a detailed description and long article. My brother in law lived in St Louis for many years and he'd say once and a while he would see a women that looked so much like me he thought I was in town! Those Bascom genes are strong. I think it's a really great story how the two of them got together and founded the company. No one gave them any breaks; they did it with ingenuity and hard work. What happened to that work ethic? I taught jr. high, high school, and college for a total of 40 years. I loved teaching, but I would not go into that profession now. I really don't like the direction the profession is being forced to go. Anyway, I'll find that article for you. I think you'll enjoy it. I am the keeper of all the Bascom pictures, etc. for my family since they've been here in N IN since the early 1850's. It a responsibility! I'm glad you were able to get the collection before the artifacts were lost. Brad and I look for Bascom items all the time on ebay. One time he wrote me and said, "They're selling your grandmother on E Bay." They were; someone in CA had a picture of her that I took in the 50's in front of an airplane hanger when she had her first plane ride. He was laughing at the "vintage photo". I was a bit insulted and hoping the seller didn't have any of me! So you never know what will come up.